Hi everyone! Welcome back to my blog. I hope all of you are doing well. 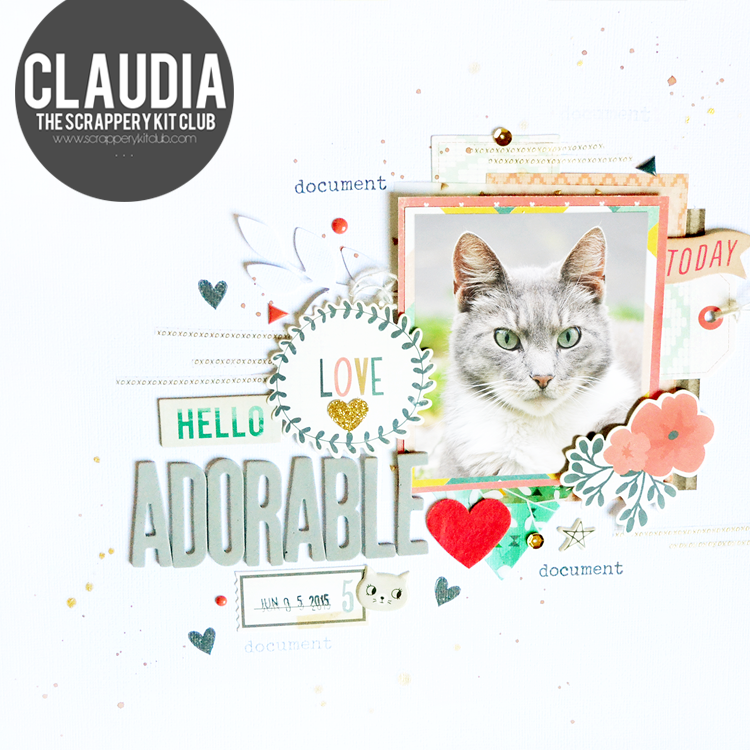 Today I am sharing the 2nd layout I made for the Scrappery using their gorgeous September TSK Reuben and BPK Bethany kits. I knew that for this layout I wanted to use a completely different color scheme than last week’s layout. It is my goal with this kit to show of the versatility. I am using a photo of my cat Mickey and it was taken during one of our ‘mini’ photoshoots when I was visiting my family last June. I must admit that halfway through the process of making this layout I wasn’t sure about where it was going, but in the end I quite like the end result. I had no idea what kind of title I wanted to put on this layout but I knew I wanted to use those grey foam thickers that I didn’t manage to use on my last layout. I decided to go with the word ‘Adorable’ as part of my title. I also stamped some hearts using the Dear Lizzy Documentary stamp set which came with the BPK Bethany kit. I love the florals from the ephemera pack in this collection and I knew I wanted to use this floral piece because it was so perfect for my color scheme. I also managed to use one of those lovely acetate triangles from the Pinkfresh Studio Happy Things collection. I wanted to use more at first but I felt like this one was the only one that matched with my color scheme. Like I mentioned in my blog post last week, I am loving the washi tape that came with the BPK kit. I thought it would be a nice way to kind of put various rows below each other and I really like the way that it turned out. I also love using the enamel dots and puffy triangles to add some pops of color to my page. Thank you so much for stopping by today, I hope you enjoyed seeing this layout. I love working with these kits and am so happy (and proud!) to be a member of their awesome CT group. Make sure to check out the Scrappery if you haven’t done that already.